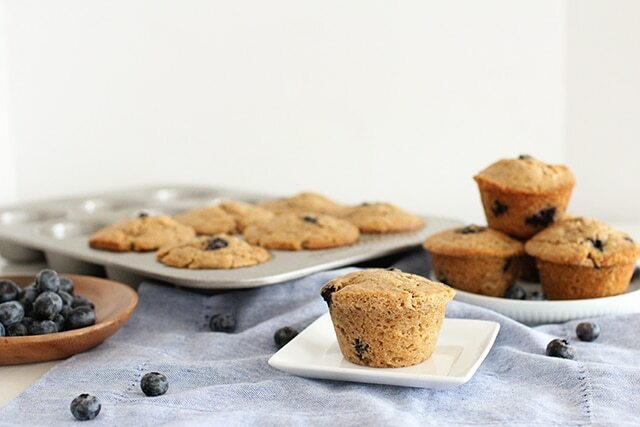 100% Whole Wheat Blueberry Muffins the way they should be: moist, fruity, and sweetened just-so. Make a double batch and freeze these for a quick breakfast or lunchbox treat. Who loves to batch-cook muffins? Let me rephrase that: Who loves to have a stash of delicious, healthy, homemade, muffins in the freezer? Here’s a nourishing whole grain recipe, famously bursting with fat fresh blueberries, that you can serve your kids with confidence, and tuck into the freezer for quick breakfasts on busy mornings. Wondering how they’ll do with 100% whole wheat flour? 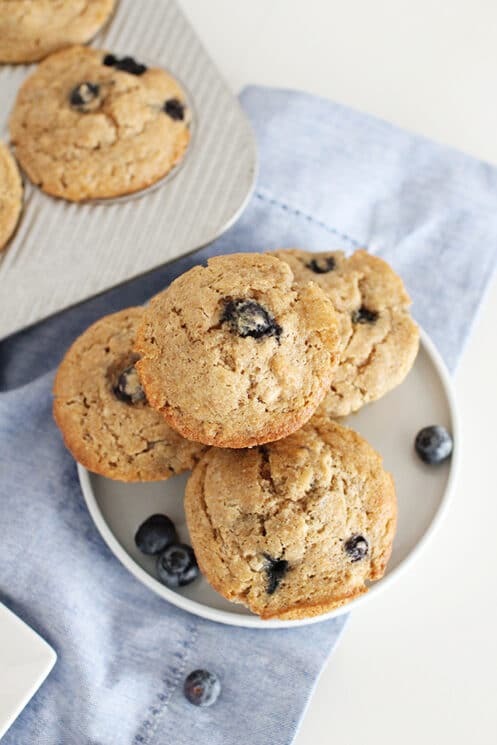 If you think they might shy away from the whole grains, choose white whole wheat flour for muffins that turn out fluffy and delicate, with fiber and vitamins that compare well to darker “red” wheat flour. 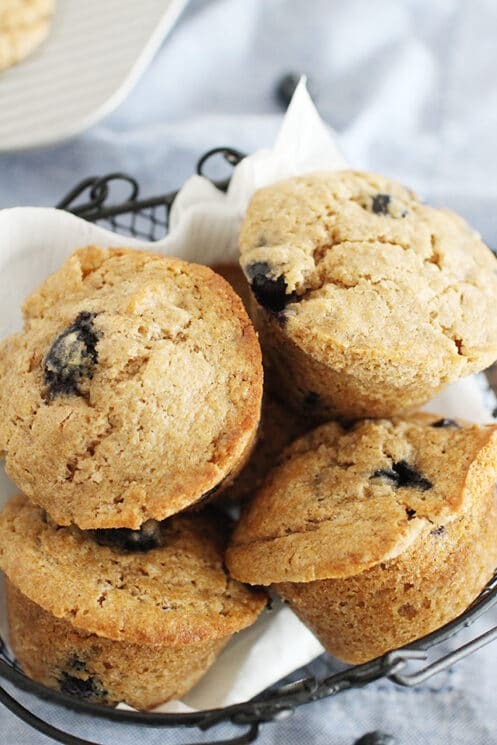 Using “regular” whole wheat flour works just fine with these muffins, too, but you can expect a slightly darker color, and more rustic texture. What Makes These Whole Wheat Blueberry Muffins Healthy? Bakers walk a fine line between making healthy fruit muffins and making, well, cake. 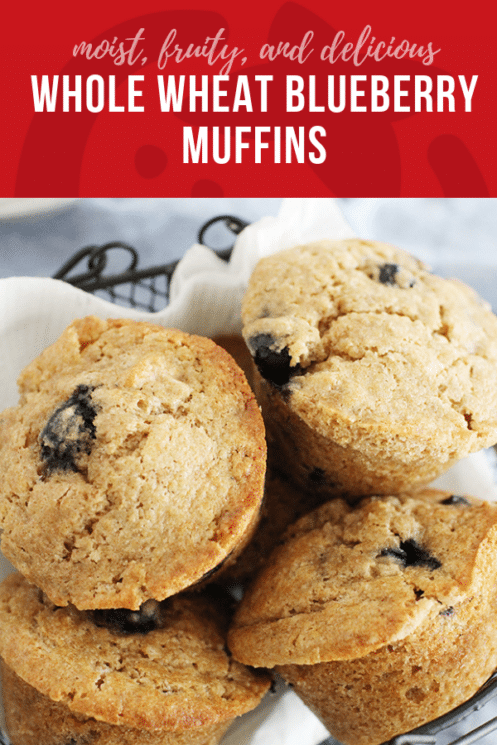 Our honest assessment of the majority of muffin recipes out there in ye olde internet world is that they have way too much sugar for a breakfast food or everyday snack. One cup of sugar (or honey or maple syrup) makes a muffin just as sweet as a pan of brownies or a batch of cookies. Somewhere around 1/4 cup of added sweeteners, maximum. Whether that’s honey, sugar, OR maple syrup. Whole grains. The higher percentage of whole grains, the better. Fruits or veggies–for nutrition, and for the message they send: that fruits and veggies belong at every meal. A flavor that kids swoon over. This recipe hits all four notes, which is why we love it so. And we’re pretty sure you’ll love it, too! In a large mixing bowl, stir together flour, sugar, baking soda, and baking powder. Line a muffin tin with paper liners, or lightly grease the tin with butter. Spoon batter evenly into tin. Bake on middle rack for 20-25 minutes, or until the tops are a light golden brown and a toothpick inserted into the middle muffin comes out clean. Nice! Do you know what the right proportions might be for White Whole Wheat flour? I bought a bag of it and would love to use it. It would be a 1:1 ratio. So for every cup of whole wheat flour you would use 1 cup of white whole wheat flour. Those muffins look so yummy. 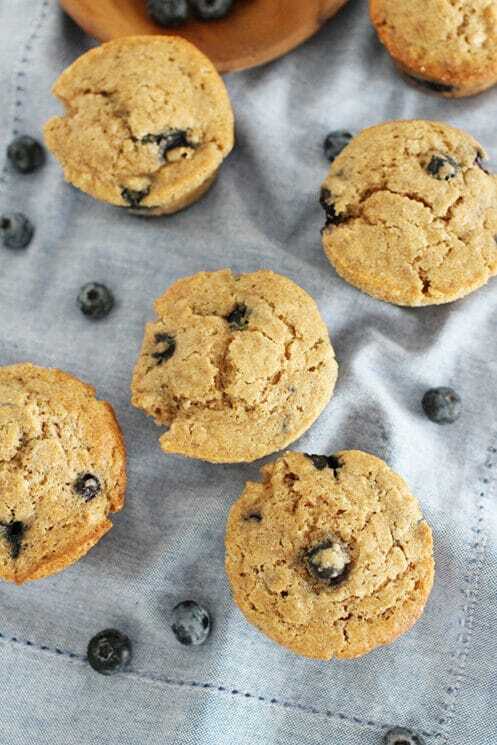 I love blueberries so much, so I know I will definitely like the muffins. Thanks for the recipe. What a healthy recipe. 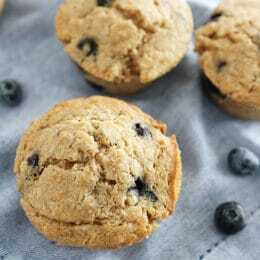 Just made these muffins yesterday and my husband, son, and I LOVE them!!! Best muffins I’ve had in a long time. I think the cooking them at a higher heat for the first part helped to make them crunchy on the outside and perfectly soft on the inside! Hi! Would coconut palm sugar work instead of sugar? Thanks. Did you make full size or mini muffins in this recipe? If I were to make mini muffins do you know how the cooking time would change? Thanks in advance! I was also curious about adding coconut sugar. Would that, maple syrup, work? Where is the applesauce in the instructions? I added it to the wet ingredients. Hope it works! The pictures and the actual instructions are so off. Even the oven temps are different. I followed exactly and mine came out very floury tasting. Almost a rubbery texture. I feel like there wasn’t enough wet to go with do much dry. I haven’t tried it with coconut palm sugar, but I think it would probably work great! These are full size muffins. If you make mini muffins I would probably cut the cooking time almost in half. Sorry about that! Yes, add to the wet ingredients. Hi, I was wondering if it is totally necessary for the butter to be cold? I don’t have a food processor so I was wondering how I would mix this by hand? Could I soften the butter a bit to make mixing easier? Or would a hand mixer work? These look great by the way! No it isn’t. This method just produces a more tender fluffy consistency. You can definitely soften the butter and add it in. Good luck! I just made these. They smell SOOO good! I realize that buttermilk has a very distinct flavor but if I can’t find it over here (we are stationed in Italy and grocery availability is, well, Italian….) what would you recommend??? You can make your own buttermilk using vinegar or lemon juice. Just add 1 Tablespoon of vinegar or lemon juice to every cup of milk and let it sit for 10 minutes. SO easy! Preeti= you could actually use any fruit that is blended. Even blended fruit found in baby food jars would work. Any suggestions on how to reduce the sugar and butter in the recipe to make them even healthier but still tasty? Also is this recipe for 12 muffins or 24? This recipe is for 24 muffins. You can experiment by adding more applesauce and less butter for sure! THe sugar you would just the reduce amount – if you experiment with it, let us know how they turn out! I feel like an ingredient got left out when the recipe was updated at some point. The batter has the consistency of cookie dough, not muffin batter. I see older comments reference applesauce and buttermilk, but neither are in the current recipe. I added milk until the consistency seemed right and they came out OK. More light and airy than dense and moist. Hi Erika! We have indeed updated this recipe, and the ingredients are correct as written. You’re right that the batter is quite thick, but I promise you the muffins cook up light and fluffy, even without adding extra liquid. (This recipe is a staple in our home… I stand behind it fully 🙂 ) I’m glad your batch turned out, too! Hi Joan, sorry about that! We’re having a technical issue with our recipe plugin today. We’re working on fixing it now. Thanks for your patience!